1st image from the InSight lander - cleaned and processed (right). Messier 20, or The Trifad Nebula is an unusual combination of dark, reflective, and emission nebula, plus an interesting open cluster of stars. It is located in an H II region in Sagittarius. The distance from out vantage is around 5200 light years away. It’s a little over 21 light years across, and is fairly bright at Magnitude 6.3. This makes it a fairly popular target with amateur astronomers. I wanted to highlight the fine Ha filaments that surround this popular target. 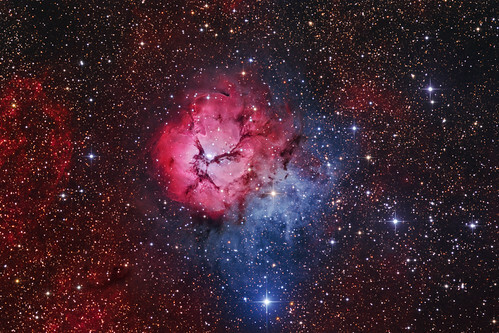 Ha areas are typically red in astronomical photos. The central area is bright, and tends to have a more washed out colour. On closer inspection, there is a terrific amount of detail running through the lobs. It looks like there are many dark cavernous channels intersecting this area. Each branching out into tiny filaments. Thx...achieved with a quite simple setup. That's a magnificent picture! So detailed and so beautiful! 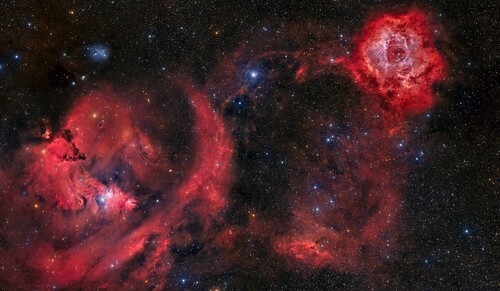 I love how you have captured so much red Hα nebulosity, not least those filamentary streamers at left in your image. But you have also shown us delightful details in the blue reflection nebula, how it wraps around the almost circular red emission nebula, but gets fainter and less blue as it does so. I love, too, how the blue reflection nebula seems to extend almost all the way to the bright blue star HD 164402 at 6 o'clock in your image. I can't help wondering if the nebula and the star just might be at comparable distances from us. NGC 281 is a H II emission nebula in Cassiopeia containing the open cluster IC 1590, which powers the ionization of the hydrogen gas. Large dust filaments as well as Bok globules, which may be the site of future star formation, can be seen. The image is a total of 5 hrs 20 min exposure in H-alpha and 10 hrs in Oxygen[III] light. Image taken with a Takahashi CCA250 astrograph and QSI683wsg camera on a Paramount ME on the nights of 16 Nov, 13, 15 Dec 2017 and 3 Oct, 5, 6, 10 Nov 2018 in Mayhill, NM (46 x 1200 sec lights @ -20 degrees C. Astrodon H-alpha filter 5 nm and O[III] filter 3 nm bandwidth; 24 darks ; 128 bias; 128 flats). Bicolor Image with Pixel Math ( R = H-alpha; Green = 30% H-alpha + 70 % O[III], B = O[III]; Processed with PixInsight 1.8.5.1353 Ripley (x64). he Horsehead Nebula is a dark nebula in the constellation Orion. The nebula is located just to the south of the star Alnitak, which is farthest east on Orion's Belt, & is part of the much larger Orion Molecular Cloud Complex.